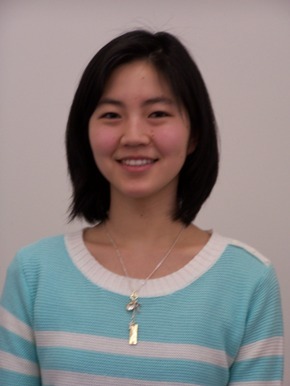 Stephanie Liu, a senior biology major from Allentown, Pa., is Falvey Memorial Library’s newest student employee of the month. Stephanie works for Scholarly Outreach; she has worked for Falvey since January 2010, her first year at Villanova. From 2010 until summer 2012 she worked for Access Services. Last summer she began working for Scholarly Outreach. She helps Gina Duffy, library events and program coordinator, with setting up for events but also has been working with Joanne Quinn, design specialist and member of the Scholarly Outreach team. Stephanie has created PowerPoint slideshows and helped mount exhibits for Quinn. “It’s one of my favorite parts of the job,” she says. When time permits, Stephanie aids Stephen Spatz, assistant Scholarly Outreach librarian and a research support librarian, with the Community Bibliography. Alice Bampton is a visual specialist and senior writer on the Communication and Publications Team. Great job on the displays, Stephanie!